Download Shoes eCommerce Mobile App UI Kit Free PSD. Here is a shiny ecommerce mobile app ui kit psd ready to use in your next mobile application design project. This is a concept ecommerce app which shows and help you find shoes you want to buy are available in nearby stores. Shoes eCommerce Mobile App UI Kit is crafted by very carefully so that you can easily customize and edit according to your needs. In this pack you can find 4 app screens for a nike nearby app. All app screens are neatly designed with fully editable elements that can be reused to create any ecommerce application. The colors used in this Shoes eCommerce Mobile App UI Kit psd are fresh and vibrant that give the design a modern look and feel. So if you want your ecommerce app to stand out from the rest be sure to give this freebie a try. 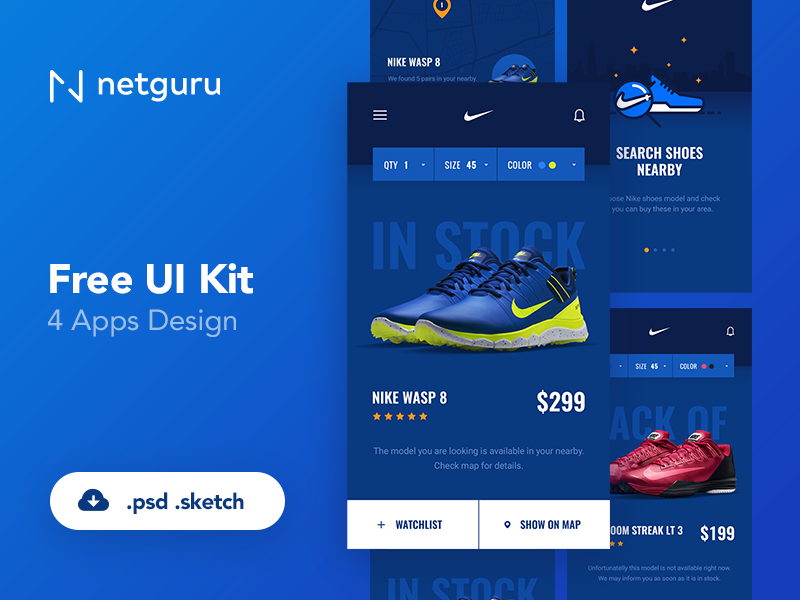 You will find this Shoes eCommerce Mobile App UI Kit Free PSD useful and can use it to concept ideas or create custom interface elements for your upcoming App design projects. The best thing about this Free Shoes eCommerce Mobile App UI Kit PSD is that you can download it for free and its easy to use and can be customized according to your needs. Shoes eCommerce Mobile App UI Kit PSD is just perfect and a great resource for any type of personal or commercial design projects. Shoes eCommerce Mobile App UI Kit is made in photoshop PSD file format. Elements are organized in layers, allows you for editing of files quickly. Hope you like this Shoes eCommerce Mobile App UI Kit Free PSD. Enjoy!